New Year’s Eve is a weird juxtaposition for so many. Goals, celebrations, endings, beginnings. Too much to drink, too much to think about. The kiss at midnight and expectations rarely met. Auld Lang Syne. New York’s Times Square. Fireworks. And too often, disappointment. Resolutions, a countdown, and then what? After last night many are thinking about earthquakes and being prepared and when will the Big One hit. It made me chuckle to hear the epicenter of the quake was close to Sidney on Vancouver Island. That’s where I’ll be spending New Year’s 2016. I’ll take the ferry to Swartz Bay and just before we dock, look up to Mt. Tuam, and remember past midnight celebrations. 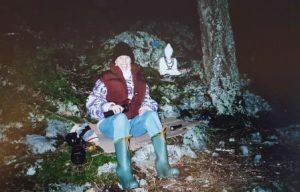 For years I had opted to spend my Christmas holidays at the Buddhist retreat up on that mountain on Salt Spring Island. The bulk of time spent in silence, meditation and prayer. I was diligent and full of purpose. A time to reboot my mind. But as December 31st edged closer I would whisper to other retreatants that we should not always conform, not always obey the rules, not always follow the prescribed path. News Year’s Eve should be a celebration. So for three years I lead a few brave souls on a clandestine trek to the top of Mt. Tuam for the stroke of midnight. Lights out at the monastery followed the last group meditation at 7pm. Everyone disappeared to their rooms with a few parting nods and bows. Lama Tara and Lama Shenpen quietly leaving the building for their private cabins at the edge of the forest. I would wait in my room. Nerves and excitement growing with every hour. Then at 11:15 we would meet at the door. Final whispered plans were confirmed. 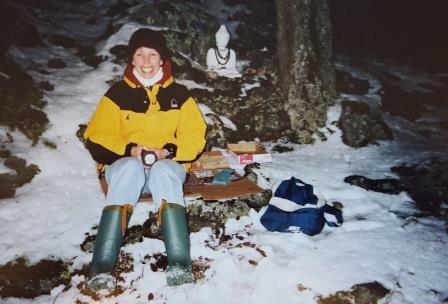 No flashlights would be used until we were well past Lama Tara’s cabin. I would have a thermos of hot chocolate for the midnight toast. The giggles started as soon as the cold air hit our faces. We were eight year’s old again and breaking the house rules. As soon as we got out to the dirt road the trek was easy. Merriment all around as we made our way to the White Buddha on the side of the cliff that overlooked Vancouver Island. Settling in before the strike of midnight we would start the prayers for an auspicious New Year and a wish for kindness and compassion. As we made our recitations the fireworks in Sidney could be seen. The slow walk back was usually silent. I always thought about the year to come. Would my prayers be enough? 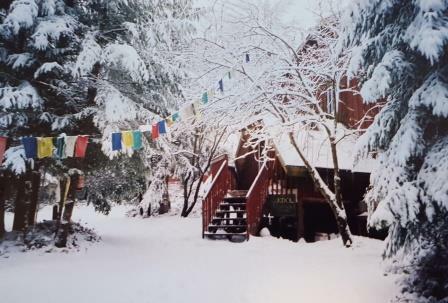 Now I spend New Year’s Eve at Lama Tara’s home in Sidney. There’s an evening walk before an early night. At 7am on January 1st, Lama Tara leads a First Light Buddhist ceremony at a local church for many of the practitioners around the Victoria area. And yes, we pray for an auspicious New Year and for kindness and compassion. When you think about it not much has changed. I will still wonder if the prayers will be enough. Who knew Sidney, BC would be an epicenter for so many upheavals and resolutions. https://triciabarker.com/wp-content/uploads/2015/12/2015-12-30-14.54.59.jpg 287 448 Tricia https://triciabarker.com/wp-content/uploads/2016/02/tricia2.jpg Tricia2015-12-30 16:08:222016-02-12 12:41:47Sidney has it all.